The HS-2000L is a five channel 10-bit 1920 x 1080i or 1280 x 720p HD-SDI full AV switcher. Its DVI-D connection makes it ideal for use with presentation software while the integrated audio mixer with balanced XLR connectors provide four channels of microphone or line audio inputs. As a complete AV package, the HS-2000L HD mobile studio enables users to switch seamlessly between video and audio sources and blend high-quality digital content on the fly. This is achieved even without external genlock thanks to the built in time base corrector. Advanced features include a 17-inch multi-image video monitor which displays multiple sources, as well as preview and programme. The system is equipped with an eight way intercom system and is supplied with four belt packs for effective communication between the whole production crew. It can store 14 logos for on-screen insertion, has a digital clock display, a five user set-up and title overlay functionality. 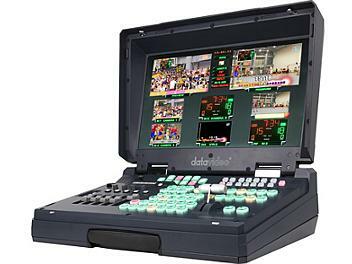 Its professional tally system enables immediate visual communication with the on-screen talent: high visibility "camera live" and "next camera" indicators are available for the director's use. As a mobile unit for outside controlled conditions of the studio, Datavideo has ensured that the HS2000L can operate in all environments. Its single integrated power centre can be fed by mains AC 240v or even a DC12v car battery if required. It also incorporates an advanced power security system which protects the electronics from spikes in the power grid. The HS-2000L is ideal for TV and video professionals working in outside broadcast or temporary video studios, such as theaters or conference centers. It is small enough to class as hand luggage when traveling (it can fit into airline overhead luggage bays) and is sufficiently portable to be installed in improvised OB vans. The HS2000L is also a great value solution for the worship, education and AV market. 17-inch multi-image video monitor displaying each source, preview and programme. Built in digital clock and 5 logo store. Lumakey function for text overlay. 4 XLR microphone or line audio input. Built in 8 channels dual channel Intercom system with four cameraman belt packs. including dual colour tally light indicator. Seamlessly switch between all sources, thanks to the built in TBC & frame synchronizer that synchronizes all inputs without the need for external genlock of the cameras. Integrated power distribution center providing a simple and secure solution for connecting all the integrated equipment from a single socket.